"Nuclear Magnetic Resonance and the Fundamental Concept of Molecular Structure" by Hannah Kaup '11 and Daron Janzen Ph.D.
Nuclear Magnetic Resonance and the Fundamental Concept of Molecular Structure is a research project which is the first part of an effort by the St. Kate’s Chemistry Department to reframe the laboratory curriculum around four fundamental concepts: structure mass, energy and chance. It engages chemistry majors minoring in STEM in the idea of structure through lab experiences that illustrate the interrelatedness of concepts across their coursework. 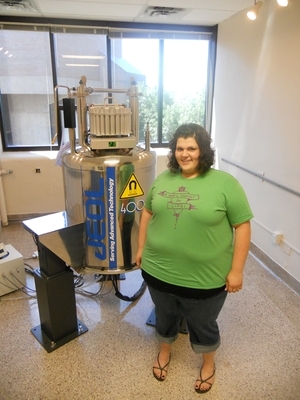 As a result of this research project, students gain hands-on experience with the analytical techniques offered by nuclear magnetic resonance (NMR) and connect the relevance of NMR to practical problems. This project is funded by the National Science Foundation and St. Catherine University donors. Simply ask Hannah Kaup about her research experience with nuclear magnetic resonance (NMR) spectroscopy and her face instantly lights up. During the summer of 2010, Kaup teamed with Daron Janzen, associate professor of chemistry, on a collaborative research project implementing NMR into the chemistry department’s coursework and labs. NMR is the only analytical technique that enables research to determine the chemical structure of a molecule. It is commonly used during the synthesis of a molecule. The aim of the Kaup’s work was to relate the knowledge of the NMR spectroscopy students gain from course work and apply it to practical problems within chemistry while using the NMR spectrometer – a research-grade instrument. While the prospect of conducting research with a professor might intimate some students, Kaup advises St. Kate’s students that the experience is meant to be educational. “Professors working with undergraduate students on research know you’re not an expert in this field. The point is to give you the experience of research,” she says. “Contributing to a research project helps give you a new-found sense of confidence and independence.